Tires are a crucial part of any car. Unfortunately, they’re also a part that people sometimes tend to forget about until something goes wrong. We’ve all been there – walking out to your car in the morning only to find you’ve got a flat, or blowing a tire during your afternoon commute home here on Long Island. While we often like to chalk these unfortunate events up to bad luck, the fact of the matter is that situations like these can be avoided by paying attention to the state of our tires. In order to help you learn to recognize when your vehicle needs new tires, our staff at Westbury Toyota has put together a short, comprehensive list of three easy tests you can do to see if it’s time to buy some replacements. With these tips on your side, getting caught off guard by an unexpected flat will most certainly become a thing of the past. Some tires come with a wear indicator built in. As the staff over at Right Turn points out, this indicator is actually a series of bars that are located between the treads of your tires. Once the tire treads have worn even with the indicator bars, it’s time for you to replace your tires. Obviously, it’s a good idea to check this indicator a couple of times a month in order to see where you’re at. The more you drive your favorite Toyota – particularly if you drive long distances on a regular basis – the more you should check the wear indicator. This is a great, easy way to check if your tires are shot but unfortunately, not every type of tire comes with these. You most commonly find tires with wear indicators on performance vehicles, light duty pickup trucks, and medium commercial vehicles. As always, if you're not quite sure If the tires you are purchasing have tread wear indicators built in, feel free to ask one of our technicians here at Westbury Toyota and we will be more than happy to confirm the presence of this safety feature and show you how to properly read the indicator in question. 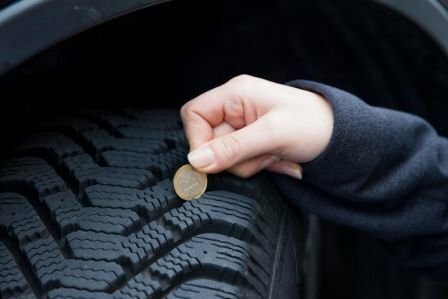 A very common, well-known method of checking your tire wear is to simply use an American penny. This test is very easy to do, as the staff of Tires Plus Total Car Care explain: All you do is take a penny and turn it so that the side with Lincoln’s head is facing you. Turn the penny upside down and then insert it between the treads of the tire. If you can see the top of Lincoln’s head, it means that the treads have worn down to the point of being unsafe and that you need to look into replacing them as soon as possible. If you can't see the top of Lincoln’s head, your tires are still at a safe tread level. The best part about the penny test? You don’t even necessarily need a penny for this test. A quarter will work just as well and in the same way: If you can see the top of Washington’s head your tires are still good; if not, it’s time to get new ones. If your tires have no wear indicator and you’re unable to do the penny test (or aren’t confident in the results), the best way to determine if your tires need replacing is to bring your Toyota in for one of our technicians to look over. The technician will examine your tires and let you know how much tread depth and pressure you have left and whether or not you need to think about replacing them. This method of checking your tires will take just a bit longer than the others, but in the end, you’ll have the word of a certified professional to go by – which can make all of the difference in the world if you're not exactly comfortable with testing your tires on your own. Tires are an essential part of safe driving, which is why it’s so imperative that you keep yours in good shape. It only takes a little bit of time to check the tire tread depth yourself (either via the penny test or wear indicators), or to bring in your tires for a quick test from one of our trusted Toyota technicans, so make sure to set aside some time every few weeks to make sure that your Toyota’s tires aren’t in dire need of replacing!